Today I'm sharing with you my 5-minute cucumber salad - a side dish for days when you need to get some vegetables on the table and there's no way in hell you're actually going to have time to cook anything. Peeling, seeding and chopping the cucumbers is the most time-consuming part of making this cucumber salad. You can make it a 3-minute cucumber salad if you use English cucumbers or Persian cucumbers, which need neither peeling nor seeding. If you have 6 minutes, toast the sesame seeds in a dry skillet before adding them to the salad. I never seem to have that sixth minute, though. I can assure you that the sesame seeds taste fine straight from the container. If you want to be really fancy, get the shaker with the mixed black and white sesame seeds. This is one of my favorite simple salads. Yesterday my 16-year-old son and I stood at the counter eating it with our fingers. Don't judge. A simple marinated cucumber salad with rice wine vinegar, sesame oil and sesame seeds. Make it even more quickly by using Persian or English cucumbers, which need neither peeling nor seeding. That's 5 minutes of active time, by the way: You do want to let the salad sit for a few minutes to let the flavors get friendly. Peel the cucumbers. Cut them in half lengthwise and scrape out the seeds using a teaspoon. Cut the cucumbers into 1/2-inch slices.Put the cucumbers in a zip-top plastic bag. Add the rice wine vinegar, sesame oil, salt, and sugar (if using). Close the bag, squeezing out as much air as possible.Let the cucumber salad sit at room temperature for 5 minutes or in the refrigerator for 20 minutes.Sprinkle with the sesame seeds before serving. 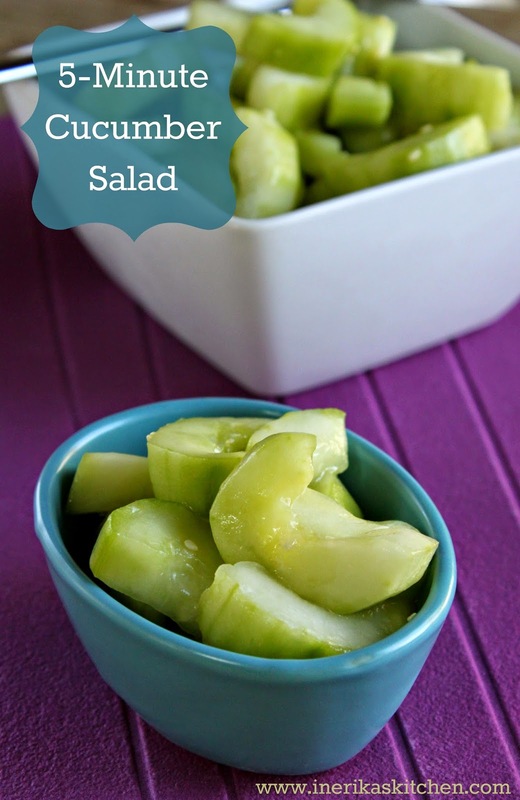 Serve chilled.NOTE: The cucumbers will get more flavorful the longer the salad marinates. Keep the cucumber salad in the refrigerator for up to three days. By the third day the cucumbers will have lost much of their crunch, but the flavor will be great. Love this - I'm a huge fan of English cucumbers and will try this soon. I grew up on something similar to this recipe with onions added. It is so refreshing. Thanks for the reminder to make this easy dish. We add a touch of sour cream and a bit of sugar to these ingredients for a little more oomph–and chopped parsley (curly) is nice too!